May 31 was Beat's 44th birthday, and true to form, he went looking for a hundred-mile race he could run to celebrate. He found the Bryce 100, a new event covering a hundred miles of trail on the Paunsaugunt Plateau, along the rim above Bryce Canyon National Park in southwestern Utah. Admittedly, I can be a hard sell on hundred-mile foot races (my requirements: They should feel like they're going somewhere, like a journey. They must be rugged, climby, or have otherwise difficult terrain. In other words, not too runnable — I fear the prospect of actually *running* a hundred miles. Little to no pavement. Also, must offer dynamic scenery.) 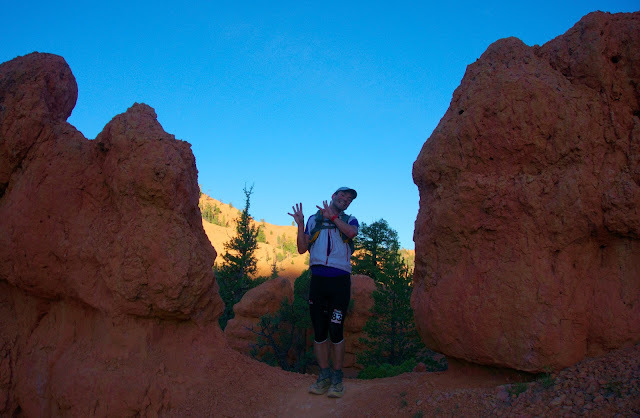 So I was excited about the prospect of the Bryce 100, which offered all of that in my childhood backyard. I spent most weekends in my early 20s backpacking and hiking the canyons of Southern Utah, but for whatever reason I hadn't visited the Paunsaugunt since I was a teenager. 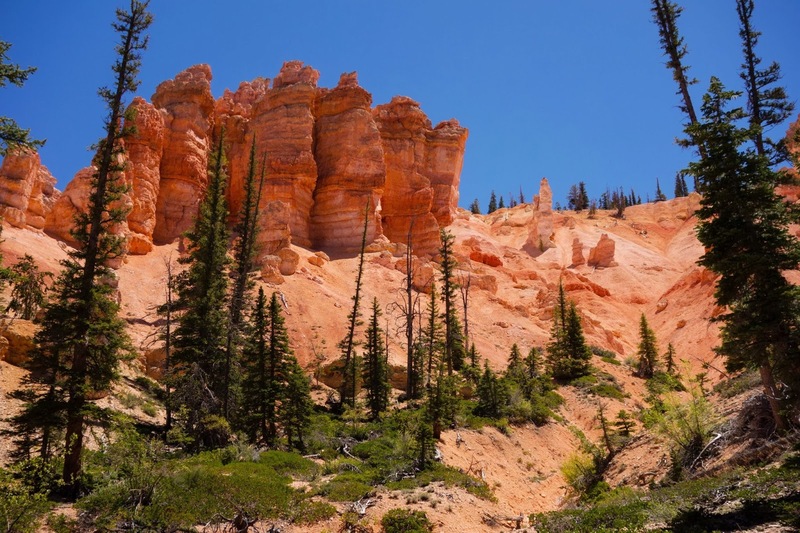 In my memory, the place was like a ride at Disneyland, with rock formations so strange that they had to be carved by humans, then painted with over-the-top bright orange and red hues to complete a cartoonish "Wild Wild West" aesthetic. 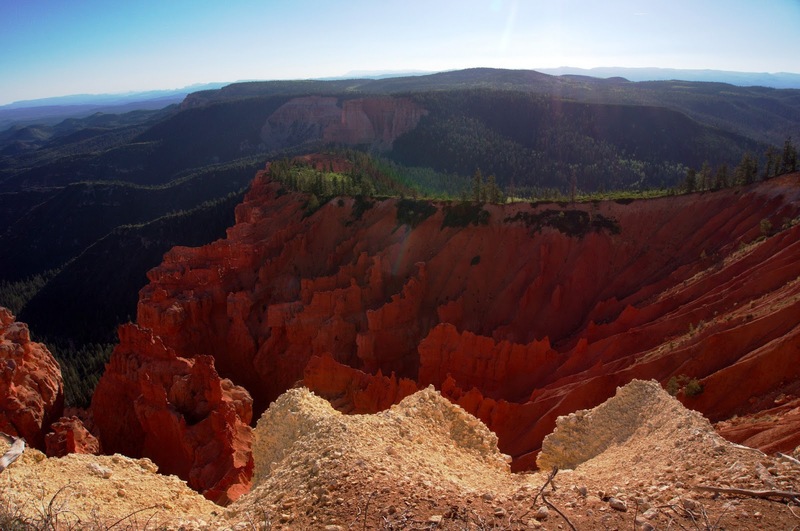 I was excited plunge myself into a journey deep into the "real" Bryce. 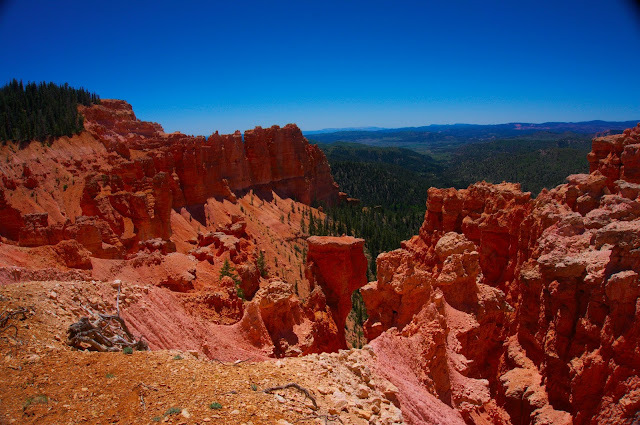 Beat flew into Salt Lake on Thursday and we drove down to Bryce Canyon City in the afternoon. He was running off of a couple of terrible nights of sleep. I also felt quite depleted — almost feverish — possibly from a bug I might have caught from my dad, or from putting in hard efforts at altitude too close to the race, or perhaps just general malaise. Either way, I wasn't feeling terribly optimistic about my physical fitness, but still excited to embark on the trek. We joined our friends Steve and Harry, who had also come out to Utah for Beat's birthday run, in the o'dark-thirty gathering around a barrel fire at a trailhead off Highway 12. Pre-dawn temps were in the 30s, and the sky glittered with stars — clear skies, in the desert, usually mean scorching bright days followed by frigid nights. 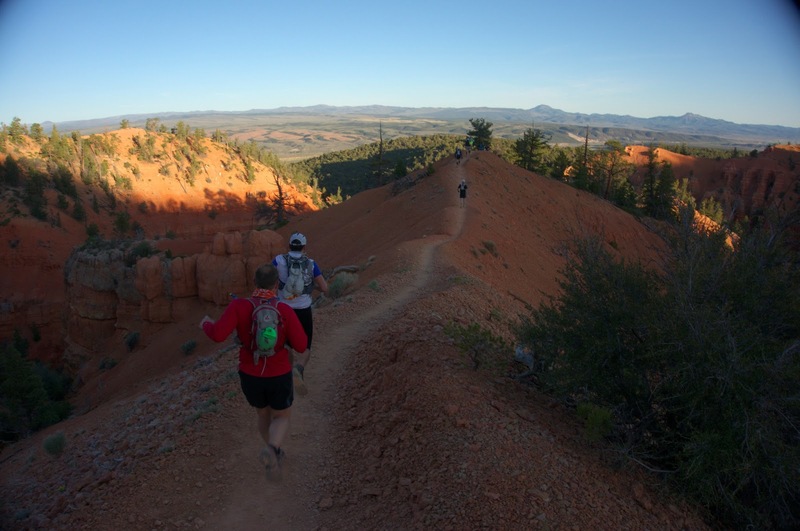 The first segment of the Bryce 100 followed the Thunder Mountain Trail — which actually does have its own namesake Disneyland ride, and was every bit as bright, campy, and fun as the Big Thunder Mountain Railroad. The undulating hills resembled a rollercoaster ride, and spruce trees looked healthy and trim, like cultivated garden trees. I half expected to see a mechanical mountain goat stroll out from behind the hoodoos, but this was the real deal. Everyone was feeling good and running well in the morning; smiles were wide and cameras were out in force. 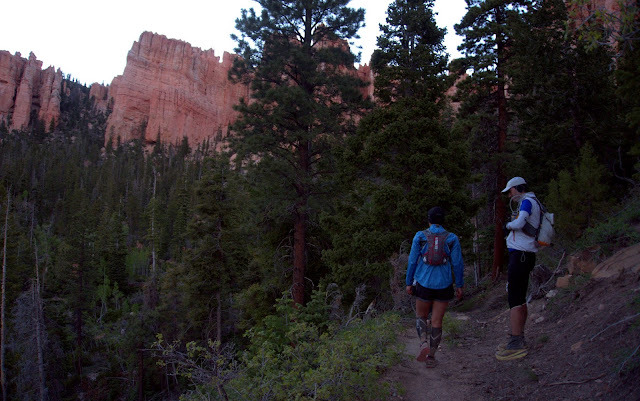 Even with the consistent climbs and descents, the trail was smooth and the pace felt easy at 11- to 12-minute miles. 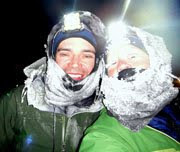 I clung to hope that these conditions would hold out, both physical and terrain. 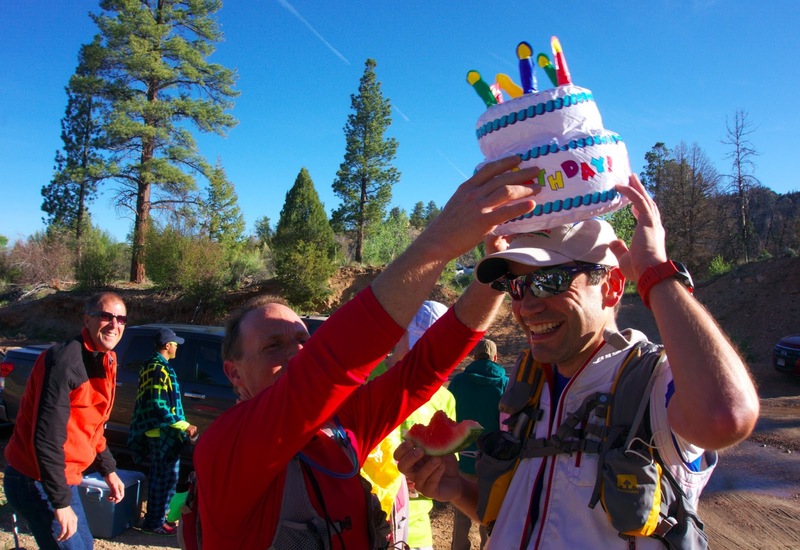 Steve and Harry had a surprise for Beat at the first aid station at mile 11 — an inflatable birthday cake stashed in a drop bag. We were standing at about 7,200 feet — the lowest elevation on the course — and Steve had to take a few extra gasps just to blow up the toy. We mustered a rather weak early-morning rendition of "Happy Birthday to You" as other runners and aid station volunteers joined in. There was general bemusement among the whole group — who runs a hundred miles on their birthday? — but it was still early enough in the race to feel giddy about the long day ahead of us. It didn't take long for things to begin to unravel. The next segment worked its way along a series of drainages amid the Sunset Cliffs, and I started to feel winded walking up even moderate ascents. Running descents also was an open-mouth effort, and although it didn't feel wise to put in such heavy exertion this early in the race, I wasn't sure I could afford much more slowness. Beat and I hadn't planned on running together, and he put some distance on me while I struggled. 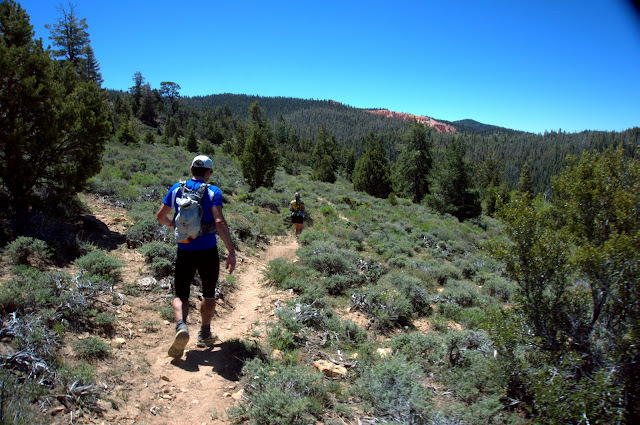 Over the rolling terrain, the trail gained enough elevation to reach Proctor Canyon above 9,000 feet, where Beat was waiting for me at the 20-mile aid station. "How's it going?" he asked, and I just shook my head. Panic was setting in. By this point, Beat was experiencing some altitude-based discomfort as well. Although nausea hadn't set in yet, I was already feeling a degree of hypoxia — breathing heavily, becoming terribly light-headed, and gasping as I battled to keep up with the "pack" we had fallen in. Looking back, I shouldn't have pushed this section so hard, but there's a general notion in the mid-pack that by mile 20, you should be able to keep up with the runners you're around if you're to hold a good pace throughout the race. Everyone who went out hard is long gone, and those who fall back might miss cut-offs. I didn't want to fall back. Miles 20 to 26 were almost mind-bogglingly tough. I remember thinking that if my dad and I went out for a six-mile hike like that, it would be a solid morning's effort and we would reward ourselves with Slurpees afterward. But this was just a six-mile segment of a hundred-mile race — one we'd have to cover again on the return. We dropped a thousand feet and then climbed a thousand within the space of 1.5 rocky miles, and then continued the steep rolling terrain beneath the sandstone cliffs, so bright and cheery and wall-like that I felt like they were mocking me. "Have to get used to this," I mumbled to myself. "You like tough terrain, remember?" Beat decided we should stick together for this segment. During a few of the short, steep climbs, I saw the flickering gray clouds of lapsed consciousness and stopped frequently to catch my breath. But every time I stopped moving, I was overcome by an intense wave of nausea that threatened to drop me to my knees. Blood flushed from my face and when I held up my hands, I could see them trembling without my consent. We hadn't even covered a marathon distance yet. I tried to decide when would be the best place to call this — next aid station? 50K mark? Try to turn that around and complete the official 100K distance? The hundred miles was downright impossible. 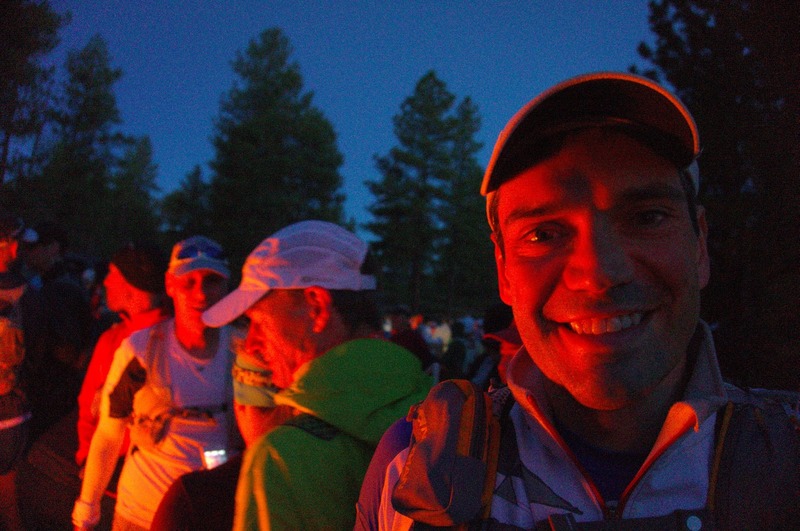 I was ashen-faced at the 26-mile checkpoint, but decided to continue forward all the same. "I could at least try to cover the first fifty miles," I told myself. "Otherwise, I'll miss out on so much." I remembered talking to my dad about these types of efforts earlier in the week. "The thing about 10 miles or 50 miles or a hundred miles is, it's all difficult. I always feel tired after ten miles and I can't imagine how I'll go on, but I resolve to go another ten, and then another. And then I keep going until I eventually hit a hundred, and I discover it's not even that bad. Of course there are continuing highs and lows, but it's rewarding to get through all of them and emerge on the other side of what had been an unfathomable journey, just a day earlier. I think the life lesson is that you can always do more than you think you can. There's always something left." Then again, I couldn't remember the last time I felt this bad just a quarter of the way into anything, unless I count the multi-day bike races I've participated in. And those are different in that they provided opportunities for more prolonged breaks to try to build myself back up. In single-stage races, there's nowhere to hide. You feel bad, too bad. Keep moving. There's a kind of satisfaction in this as well. After mile 26 I decided my body and I were going to go our separate ways for a while, and I turned my focus to the expansive vista at the edge of my feet. 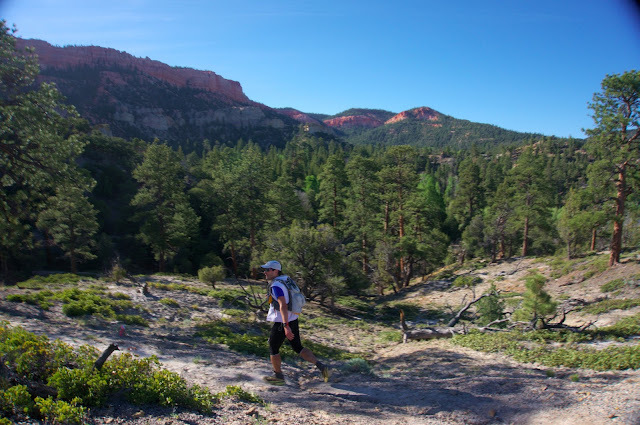 The Grandview Trail rolled along the rim of the Paunsaugunt, providing endless views — the red cliffs, the distant mountains, the green farmland along the Highway 89 corridor. 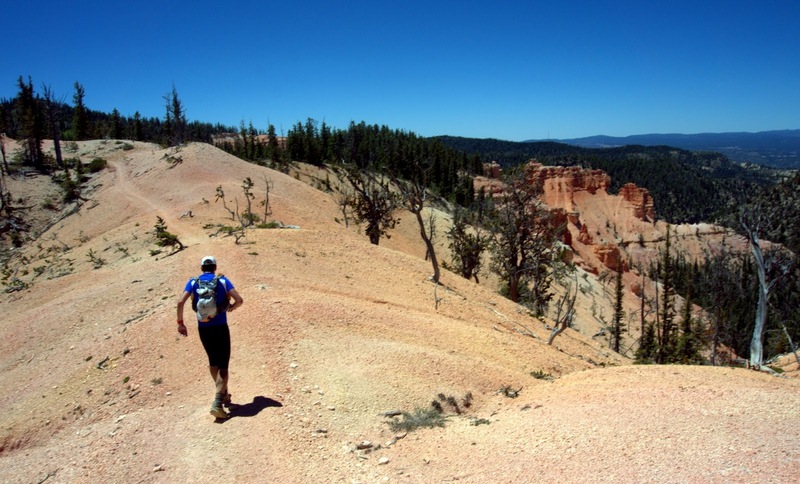 I lapsed into happy memories of my youthful explorations of Southern Utah, when I'd hike ten miles a day and that was damn hard, too. It never gets easier, whether I go ten miles or a hundred. But if I reach for a hundred, there sure is a lot of amazing country out there to see. I can't say things became any easier, but I became better at convincing myself that it didn't matter. Still, as time drug on, I was only taking in a minimal amount of food to sustain alertness while battling pukeyness. Often how it went is I'd avoid eating altogether until we reached an aid station, and then hunger would rush in once I'd sat down for a few minutes. I'd eat something substantial, like a half bean burrito or a chocolate chip cookie, and then have to swim slowly through my nausea for the first mile or two out of the aid station. If my stomach was empty, the nausea wasn't so bad. But then I'd become more aware of my flagging energy and hypoxia. Out in the open, a fierce wind blew, carrying with it a lot of dust and sand that lodged in our throats and irritated our eyes. This was tough hundred-mile racing at its finest — the dry dust and heat of the desert, combined with the high altitude and climbing of a mountain run. At this this point I'd convinced myself that the heat of the day and sun exposure was causing my nausea, and everything would get better once darkness and cold finally descended. Before mile 50, we spent some time running with a woman from Jersey named Grace, who was running her first hundred-mile race, and also first race out west. She was curious about my "Ride the Divide" race and also surprised that I'd never worked with a coach. "I never set out to be an athlete," I said. "Really, I still don't think of myself as an athlete. I just like to spend lots of time outside, have visceral experiences, and connect with like-minded folks. 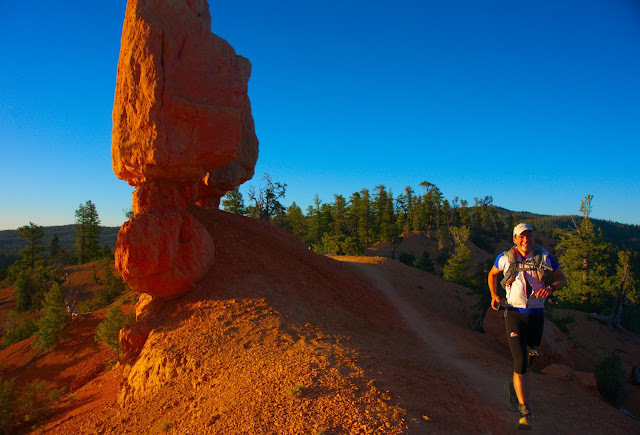 Endurance sports are a great way to achieve all that." As the sun set, my stomach was beginning to feel better, and I convinced myself I'd moved through my slump and that the back half would be less grueling. We'd been moving slowly enough for the past 25 miles that my legs still felt fairly fresh. Also, I'd been experimenting with blister control by cleaning my feet and changing my socks every 20 miles, and it seemed to be working — fifty miles and no foot pain. Still, when we reached the halfway point in fourteen and a half hours, and Grace suggested that maybe we could wrap it up under thirty hours, both Beat and I laughed. 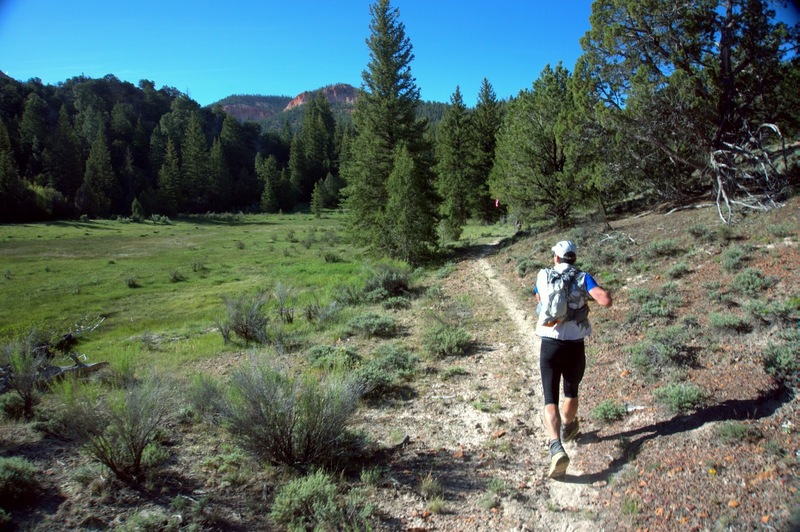 Everyone knows that these hundred-mile races haven't even started at mile 50. Geez if you felt that bad that early I can't imagine it was incredibly pleasurable. Tough stuff you be. The pics are beautiful. I wish I could have been there though I'm incredibly fat and out of shape so I don't know if I would have made it 10 miles. Kidding, I probably will never finish a 50 or 100-mile race, ever. Plus for my birthday this year I'd have to run a 52-miler. Sheesh. Kudos all around. And the photos are great. That laser-clear desert light is amazing. Your tenacity amazes me. You really are one tough cookie. Your tenacity never seems to amaze me. You really are a tough cookie, not only physically, but mentally and emotionally. I meant never ceases to amaze me! I love your blog and your writing style! You took me straight back to the course :). I think I went through similar highs and lows at each point (first 10 miles was amazing! second 10 miles was a slow descent to nausea and puffy gorilla hands...). Thank you and Beat for being patient with my slew of questions and for offering words of wisdom and advice to this newbie. It was a humbling and awe-inspiring experience all around. Have fun at Laurel this weekend! In Alaska, I also lived at sea level. 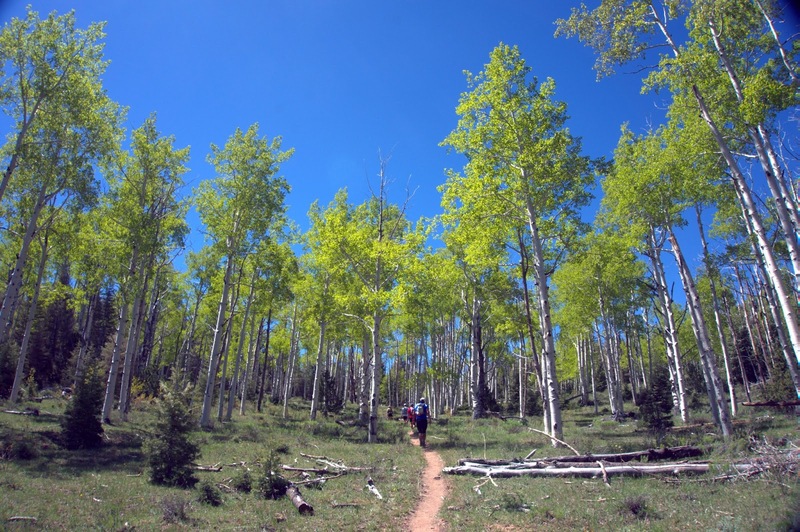 But altitude acclimation is an interesting phenomenon. I agree with those who observed that performance levels at high altitudes is not necessarily as cut and dry as simply acclimating to the elevations. Looking back, I've always experienced struggles above 9,000 feet, even when I was a Salt Lake resident. This race spent a lot of time at or above 9,000 feet. I think I'd have to actually sleep at 9,000 feet for two to three weeks to bring my altitude performance up to the level of my sea level abilities. Wow. I only wish I'd felt as GOOD as you did during those first 50 miles :-). Love the Mumford references. "Let me learn from where I have been…"
Way to persevere. Love the write-up. Wow. I love reading your blog and your tenacity and endurance inspires me. My friend and I take a road bike tour once a summer--4 days/450 miles-ish. We have done everything between Utah County and St George on the south end and SL to Garden City north. We're stumped for this year and thought driving somewhere and adding in some trail run/hikes would be fun, even if the bike miles are cut a bit. Any ideas? Becky, have you spent much time in the eastern Utah/Lake Powell area? Back in 2002 my friend and I did a 600-mile loop from Moab, through Colorado's San Juan Mountains, skirting Lake Powell near Hite and up Highway 95, up to Hanksville and Green River. It was a fantastic loop and there are tons of hiking options along the way, especially in Colorado.